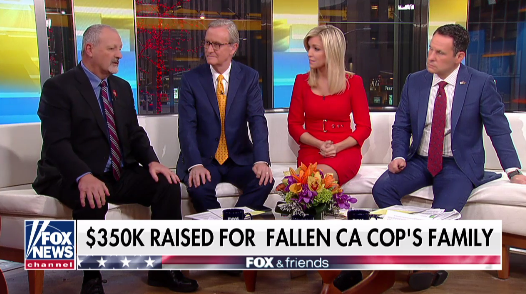 With the help of Fox & Friends viewers, the organization Tunnels to Towers raised $350,000 to pay off the mortgage for the family of the late California police Corporal Ronil Singh, who was killed during a routine traffic stop on Dec. 26. The expenses not only covers the mortgage for the family’s home, but it will also go towards education for Singh’s five-month-old boy. “It was right here on Fox & Friends that the Tunnel to Towers Foundation pledged to raise $300,000 to help pay off the Singh’s family’s mortgage,” said Brian Kilmeade, before introducing Tunnels to Towers Foundation CEO Frank Siller, who provided an update. “I’m very proud to announce with the help of Fox & Friends viewers and most certainly you guys here, that we not only reached the $300,000 to pay off the mortgage, because of the generosity of Americans that we went over that – we were able to give them an extra $50,000 for educational leads for the five month old and it goes even beyond that,” said Siller. “They are immigrants, they did immigrate here to this country to pursue the American dream; but they did it the right way, and they were killed by someone who’s not only a criminal, but came here the wrong way,” said Kilmeade.